If your home has wallpaper that's outdated, dingy, and ready to be removed or replace, you may find yourself wondering if you should tackle the project alone or hire a professional painting contractor for the job. If you opt to do it yourself, you'll most likely realize very quickly just how difficult — and messy — it can be to remove wallpaper. Unfortunately, there really is no simple way to remove wallpaper, and it only gets more difficult the longer it's been in place. There's no way to know just how easy or difficult a wallpaper removal project will be before you start. The wallpaper might strip off effortlessly, or it might cling to your walls. When you have our expert painters on hand, any issues will be well within our knowledge-base. We've experienced every wallpaper problem there is, and we have the skills, tools, and expertise to solve them. Removing wallpaper often involves saturating the wallpaper with a special solvent to help it separate from the surface of the wall. If too much moisture is applied, it can seriously damage the walls. Drywall is especially vulnerable to damage from this solvent. Our professionals will be able to guarantee that no damage is done to your walls during this project. 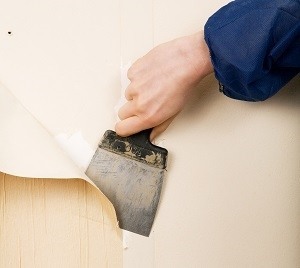 Often, saturating your walls and scraping or peeling off wallpaper will make a significant mess. With drop cloths lining the floors beneath the walls, scraps of sodden wallpaper will quickly accumulate to create a large mess. Once the walls are free of every shred of wallpaper, cleaning up the mess will be the next task, which will involve gathering and then disposing the soggy wallpaper pieces. Our professionals will always leave your home as we found it—minus the wallpaper—and we'll treat your property with respect. Do you need a professional for wallpaper removal? Call Premier Painting at 978-532-7788 or complete our online request form.